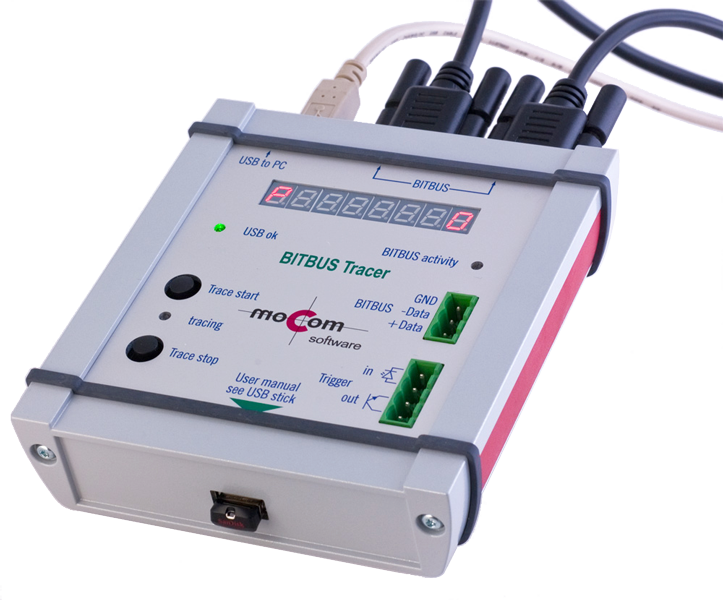 The BITBUS-TRACER helps troubleshooting a BITBUS network. It is linked to the BITBUS network and listens to all messages that are exchanged on the network. Depending on how it was configured it buffers all messages or only special messages for an evaluation. Escpecially when old manufacturing equipment has to be taken to current technology levels, often the data assignments in the BITBUS protocol are not available. This is where the BITBUS tracer can help to analyze the data exchanged between master and slave stations. USB-BITTRACE is the handy successor of the bigger BITTRACE, though rugged enough in its heavy aluminum box for any service use. The former RS232 connection is now replaced by a USB virtual com port. Works on all standard BITBUS RS485 lines. USB virtual COM port to PC terminal. DB9 plug and socket for convenient wiring, also pluggable screw terminals. Start/Stop from terminal or front panel keys. Trigger on error, flags or node address. Waits for programmed count of trigger conditions. Hardware trigger or gate input 5..24V. Hardware trigger output open collector. BITBUS-Tracer as described, with user manual and other important BITBUS information on USB-Stick attached to lower panel. Rental is also available for USB-BITTRACE. It will be shipped to arrive the first day of rental and must be returned in a way to reach us one day after the rental period ends. Shipment is at your expense. Rental is subject to availability for the period. The tracer is connected with a terminal programm via the USB interface after selection of the assigned virtual COM-port in your Windows® terminal program. Various connectors are available to connect to the BITBUS network. 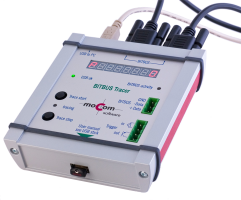 With the trigger inputs the Tracer can be controlled by an external signal. The trace can be just stopped (EDGE-Mode) by a trigger signal or started and stopped again (GATE mode). The edge polarity can be set by software. The trigger output is always set simultaneously when the tracer has stopped the trace job. The polarity of the output can be set by software, too. Without filters set up from the console interface all messages from all sources (master and slaves) are recorded.